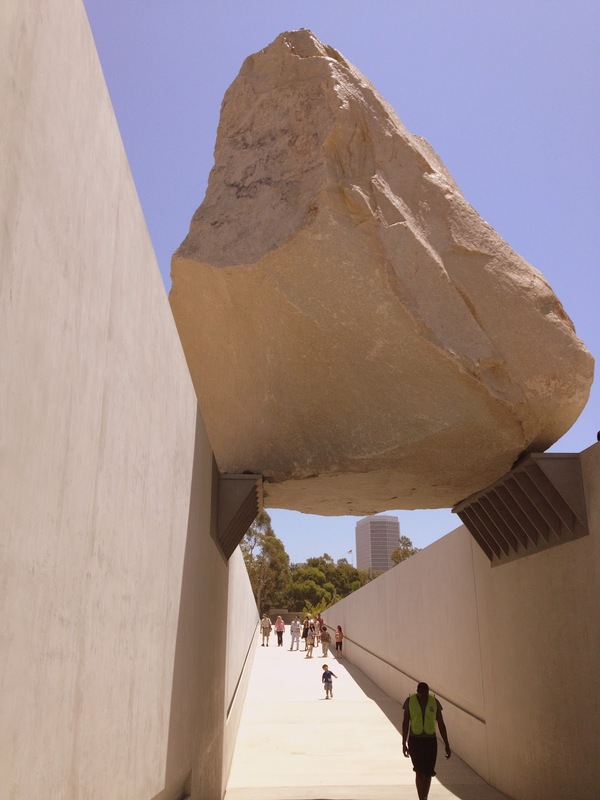 Good for: Experiencing Los Angeles in a unique manner; learning more about the city’s well-known landmarks and learning the city's history in a fun way. With-Whom-to-Go: The bike tours consist of a guide and other guests, creating groups that can range from as little as three or four to as many as fifteen. You could go alone, but it’s more fun to tour with a friend. They also provide tours for private groups, Kids are welcome. The $ Factor: $$: Tours range from $52-$162 and last from 2.5 hours to 6 hours, with anywhere from 11 miles to 32 miles to cover. The 4-1-1: Bikes and Hikes LA provides the bike, helmet, safety vest and a bottle of water, but make sure to bring extra water, a snack (like an energy bar) and of course, your camera. 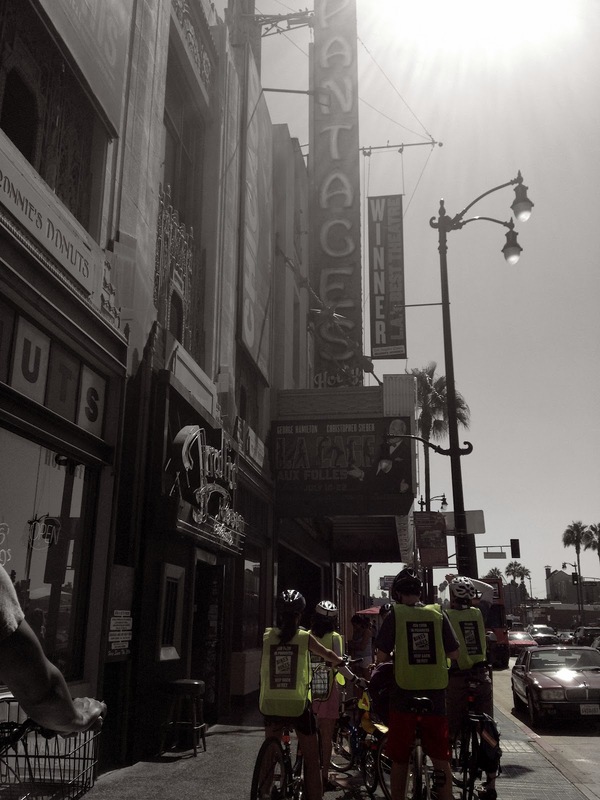 I’ll Be Back…: For the 32-mile LA IN A DAY tour, now that I’ve conquered the HOLLYWOOD tour. 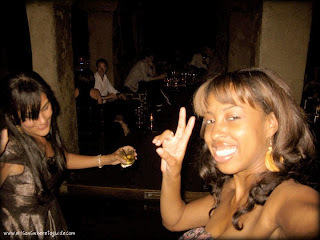 A recent 4th of July holiday trip to NYC inspired me to get out more when I returned to LA. On the East Coast, I walked miles upon miles each day, trekking up steep subway platform stairs and simply being out and about in the city. Here in LA? The most time I typically spend outside are the 55 minutes on my lunch break – sitting – and stuffing my face with food. So when Bikes and Hikes LA owner Danny Roman was kind enough to offer a complimentary tour (quick story: I met him about a year ago and we’ve kept in contact throughout the months), I immediately jumped at the opportunity. I won’t even lie; I signed up for the HOLLYWOOD TOUR because it was the shortest distance and was ranked as “easy” on the website. And even then, I was extremely nervous about going. I hadn’t been on a bike in over six years, and 11 miles sounded considerably far, especially when you’re talking about weaving in and out of traffic, hopping on and off curbs. Plus, the day prior to the tour, I had tried to ease back into my workout plan by running and failed miserably. I had to stop because my legs began tingling. Yeah, I'm that out of shape. Our friendly tour guide (pictured below) brought me back to reality. She gave us some standard release forms to sign, got us situated on our bikes, shared a few safety tips and then we were off. and onwards through Larchmont Village and Hancock Park. La Brea Tar Pits for quick rest, pictured below. Then off we went to LACMA (pictured below) and through Park La Brea before reaching the Original Farmer’s Market, where we had a ten-minute break. We then ventured up Beverly Blvd., La Brea Ave. and Fountain Ave., back to the Hollywood & Highland Center to conclude the tour. you never forget how to ride a bike! Overall, the entire tour was great. It offered the perfect balance of cycling and breaks to stop and hear fun facts about where we were. Being a native Angeleno, I’ve spent thousands of hours at places like Miracle Mile and Larchmont Village, but it was extremely eye-opening to hear their history: how streets received their names, why neighborhoods were formed, what places looked like 100 years ago, and even current events trivia, like which celebrity did what at which place. Our tour guide offered up the good, juicy facts, so it didn’t feel like we were on a boring school field trip, learning random, useless tidbits of information. There were times our ride was so peaceful and relaxing, especially when we were winding through picturesque neighborhoods with tree-lined streets providing ample shade and cool breezes. It felt like it was straight out of a movie scene. Then there were a few other times when I kept thinking, “OK, are we done yet? Where’s the finish line? Can someone push my bike for me?” Those occurred more towards the end, after pedaling for three hours, when the sun was maddeningly beaming down our backs and the traffic jams on La Brea Ave. (pictured below) felt stifling. As for the fitness level, it’s not too bad at all. If you’re a little rusty (like I was), you might be somewhat sore the next day (like I was). If you’re in shape, you’ll definitely have no problems at all. 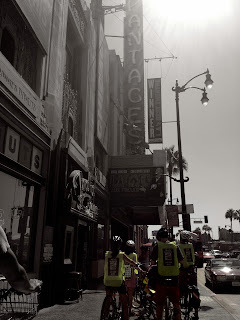 I say the next time you’re looking to exercise, want to learn more about Hollywood, or want to show an out-of-towner the city in a novel way, definitely try the HOLLYWOOD Tour by Bikes and Hikes LA. It’s worth it, especially with a complimentary museum ticket thrown into the mix, and you’ll get the 4-1-1 on the streets, neighborhoods and landmarks that you pass all the time, gaining a deeper appreciation of this quirky city we call Los Angeles. See you on a tour soon! I’ll Be Back…: For more crostinis. OMG – I can never get enough! I’ve come to like not only its great ambiance, but also FIG & OLIVE's light fare, often times tossed with tons of – well, you guessed it – figs, olives and olive oils. By far, my favorites are the crostinis, pictured below – squares of toasted bread topped with varied colorful ingredients. If you’re indecisive like me and would order the whole menu if given the opportunity, then ordering a few crostinis is a great way to easily sample a lot of different flavors. Last month, I was invited to check out the new summer menu, which includes more than 20 additional French Riviera-inspired dishes (YAY!). Now a couple months earlier, business entrepreneur Michael Ferrera (who’s claim to fame includes custom clothing designs, fashion styling and now authoring a book, The Perfect Gentleman’s Pocket Guide) expressed interest in being a #WilsonsGuide guest blogger, since he’s interested in expanding to write about food (talk about ambition!). I definitely had to see if he had a knack for knowing all about eating, drinking and being merry and I also thought it would be nice to have a gentleman's perspective instead of always mine for a change, so I asked him to come check out the new menu with me to hear what he had to say. We met one early Thursday evening for dinner and got down to the basics of exploring the new menu. We decided to each go with the $37 Prix Fixe 3-Course Dinner, which, by the way, is highly recommended if you want to try a lot on the menu, without ordering too much food. Miss Wilson: Well, you already know I’m a fan of FIG & OLIVE. Good to see that Mr. Ferrera passed the #WilsonsGuide “test” of knowing where to eat, drink and be merry in Los Angeles, which means definitely look out for a few new guest blog posts from him in the very near future! 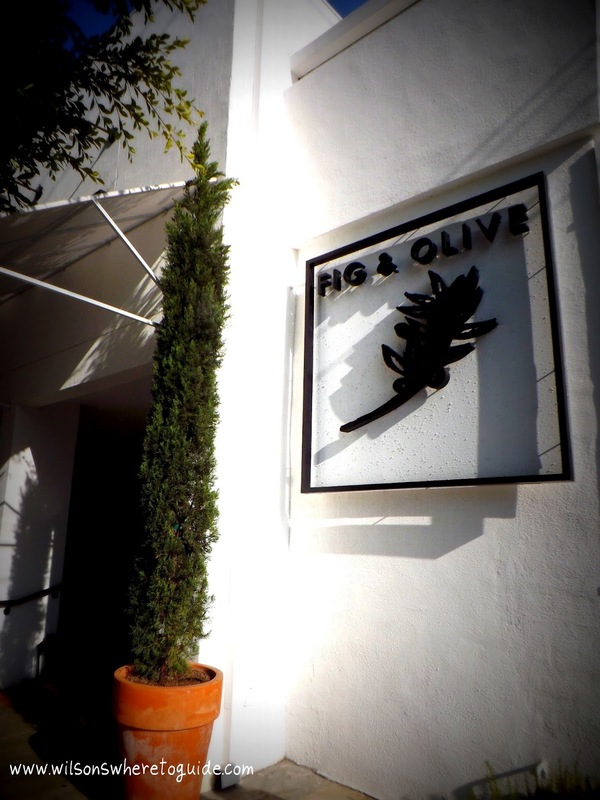 And of course, remember: the next time you’re in the mood for seasonal foods with a Mediterranean flair in what feels like a Mediterranean oasis, you know where to turn – FIG & OLIVE. The 4-1-1: Parking options consist of valet, an adjacent parking structure, free street parking, metered and street parking. I’ll Be Back…: For the Tiki Nights at The Spare Room and Monday movie nights at the Tropicana Bar! There’s been poolside networking mixers. Post-Oscar late night romps. Nights that disappeared too quickly after spending them in a dance trance. One solo champagne cocktail after being stood up by a date, a few good meals and plenty of memorable cocktails with friends. And that’s only my history with the Hollywood Roosevelt Hotel. That’s not even touching on the city’s long love affair here. It was host to first Academy Awards in 1929, the home for Marilyn Monroe, the setting for Entourage episodes and the hotel of choice for scores of celebrities including Clark Gable, Hugh Hefner and Prince. 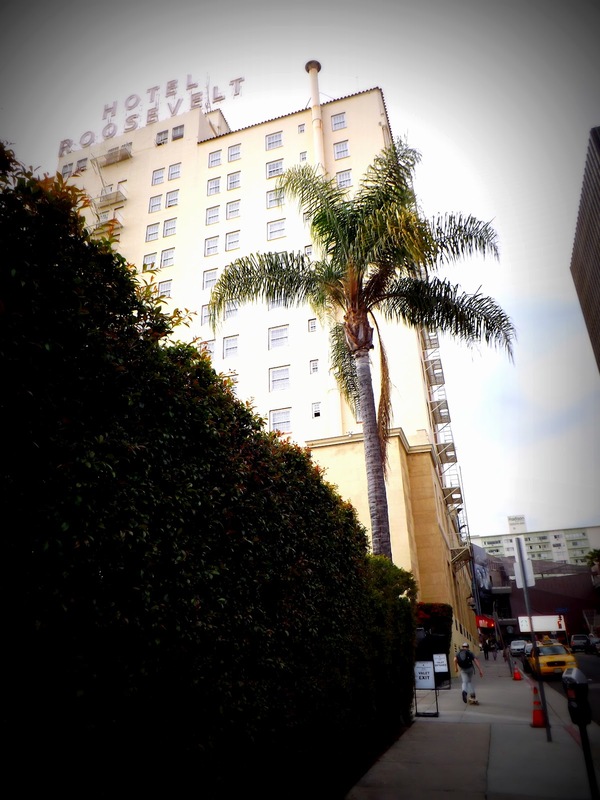 What amazes me is that regardless the decade, time, day or situation – whether it’s a late night or an early evening, after a crappy experience or before starting a night on town – the Roosevelt Hotel has never let me – or most of LA – down. It’s always had so many bar and lounge options to never disappoint: if you’re looking for a good juicy burger and a refreshing alcoholic shake, 25 Degrees has you covered. Want to dance and dance and dance like it’s 1999, then hit Teddy’s. Outdoor chilling at Tropicana…And, if you don’t like the vibe of one place, you can walk a few feet and have a completely different experience. I consider the Hollywood Roosevelt Hotel one of the best destinations in Tinseltown whenever you’re in the mood to check out the glamorous scene while still having a moderately relaxing time. It’s been around for 85 years, and doesn’t look like it’s leaving anytime soon. Perhaps I’ll see you at one of its bars in the future! 25 Degrees is the place to go for amazing classic American food and milkshakes. Thick grilled cheese sandwiches, gigantic crunchy onion rings and without a doubt, some of the best burgers in town. My mouth is watering just thinking about them; they’re ridiculously enormous and juicy, topped off with great condiments, like chunky avocado and tangy BBQ sauce. But hands down, one of the best things to order here is a milkshake…with a little kick, of course. I’ve tried about four so far, and they all have amazing flavors; the Guinness with house-made chocolate sauce; the Salty Caramel with chunks of chewy caramel; the Bananas Foster with tons of bananas and subtle hints of rum; and the Night Owl, with Kahlua, Godiva Dark Chocolate Liqueur and house-made chocolate sauce. Frothy and filling, they’re a great way to beat the heat. Public Kitchen & Bar is what I’d consider to be the most upscale of all of the Roosevelt Hotel venues. It has a drop dead gorgeous interior that pays homage to old Hollywood glamour. The caliber of its cuisine and the sophistication of its cocktails go hand in hand with the setting, too, as they taste – and look – classy and exquisite. One of my favorites is the St. Germain cocktail, pictured below. With a champagne base, it’s quite light and refreshing, perfect for the summer. I also recommend the oysters. There are several types to choose from, ranging from both the East and West Coasts: Belon, Coromandel, Fanny Bay, Hood Canal, Kumamoto, Malpeque, Phantom Creek, Raspberry Point, Well Fleet, Salt Pond and Kusshi. The ones I've had have always been extremely fresh and delicious. The Spare Room is a bar with a twist…or should I say, a bar with a big bowling lane that takes up half of the space. Classy and comfortably designed, this bar caters to the competitor in all of us, featuring bowling to keep you occupied for hours. If you’d prefer your wedges or loafers over bowling shoes, partake tons of other games from the comforts of your seat, including chess, Jenga, card games and more. In fact, tables double as a game chest, so you just open sesame and get to playing. It’s also kind of cool to check out the old-school games in the glass displays throughout the room. I was quite impressed with the food, which does creative takes on classics like tater tots, Caesar salads and deviled eggs, and the cocktails come recommended, with flavors that truly embodies the essence from which they’re made. Library Bar is quiet and dark, with a funky décor of fur rugs, a roaring fireplace, slanted mirrors and big, oversized black couches and chairs. It’s very sleek in design, but it also has somewhat of a warm intimacy to it. It’s a great place to get cozy and have a good, long conversation with someone without too many interruptions. And of course, the cocktails are some of the best I’ve had, probably anywhere, not just because of the Farmer's Market herbs, fruits and ingredients used, but also because of their inventiveness. I’ve seen bartenders use blowtorches to melt marshmallows onto chocolate-based cocktails. Let’s just say that was an experience I’ll never forget. Teddy’s is probably the most exclusive of all Roosevelt venues, complete with bouncers, guest lists, velvet rope and throngs of crowds by the door, anxious to be let in on weekends. Hey, I can admit it - there have been a few times that yours truly couldn't even make the cut to get in, due to the strict door policy. But when I have gotten in, I've seen lots of high-profile celebrities and fashionable trendsetting types crammed in there, and let me tell you, it gets crunk. It’s definitely a place to grab table service or to even get your dance on. Or at least, I most certainly do. It’s currently going through a renovation right now, so it’ll be interesting to see how it looks in the future and how – if at all – its vibes change. Tropicana Pool and Bar is the outdoor bar and lounge. 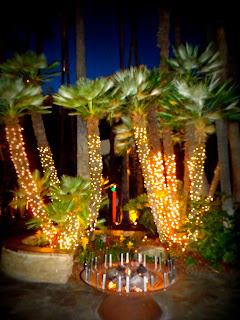 It’s rather serene to walk through lush, tropical foliage that has a few fire pits and secluded sitting areas scattered throughout before entering the main area, where a glistening turquoise pool is the breathtaking center of attention. Soaring palm trees, hotel room balconies, an outdoor bar, lounge chairs, tables and more fire pits next to plush lounge seating are neatly arranged around the pool. Poolside at the Tropicana bar is an ideal place to enjoy these warm summer evenings. And, for the next few months, there will be movies on Mondays night. 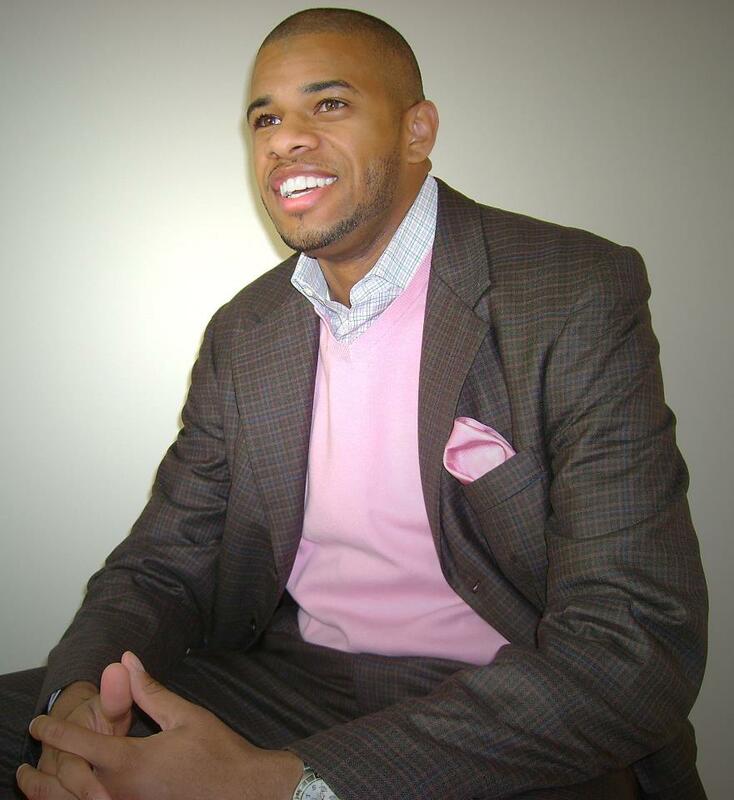 Check out the website below for more details.